A Podcast by Fans, For Fans or even Casual Viewers if you wish; celebrating 50 years of Doctor Who. This week; James, George and Ian discuss their opinions about this second episode of Series 7 Part 2. The visuals, the prosthetics, the plot and a sing-along, What else can we NOT talk about? tune in to find out! In this episode; James, Ian and George take it upon themselves to look at the new Opening episode to another series of Doctor who.... or half series with Series 7 Part 2. Along the way they discuss Spoonheads, Airplanes and Celia Imrie, Tune in to see what they thought of this story. In this episode of the 49 Up Podcast, Ian prepares to take off for Sunny LA for "24 hours of Gallifrey". The Biggest Doctor Who Convention with 3200 attendees confirmed along with a bounty of different Guests from the Dr Who Family. James probes Ian's brain of previous experiences and what he is hoping to see at the 24th edition of this gigantic Who Event. 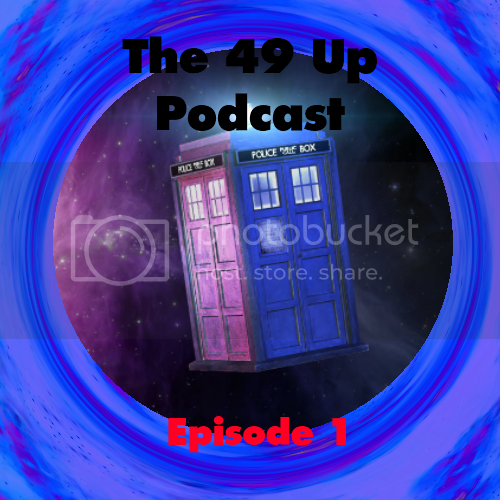 In this Episode of the 49 Up Podcast, we step to the side of Doctor Who Fandom. To Fans who created, not just a Fan Film, but a Spin-Off Fan Film that gathers more and more attention on Youtube as it progresses further into it's Run; Time Agent. On the Verge of it's 4th Series, James and Ian discuss the show's current run, aswell as Fan Films in General and also have their first ever interview with Co-creators of the series; Jaime Carroll and Billy Treacy. Episode 10: Monster Files #1 - A Discussion about Daleks! This week James and Ian tackle an Simultaneously Vague and In-Depth Discussion about the Doctor's Greatest Enenmies; The Daleks. Along with various Detours and Laughs galore it's our LONGEST EPISODE YET! Join us in our discussion by sending your views on the Daleks to the49uppodcast@gmail.com and we'll read out/play your feedback in a future Monster Files. James Brings you this surprise Podcast extra, Semi-commentating on the National Television Awards. Anger and Damnation to come aswell as a quick reminder on how Doctor Who's Broadcast Schedule looks for this year so far. Podcast Xtra. Not Quite an Episode, but Still important enough for a special release. First off, it's a Quiz. Kind of like what James and George did in Episode 1, but alot more formal and prepared. Ian and James go head-to-head in a challenge, chaired and quizmastered by a member of the DWP; James Rockcliffe. Who will win? You'll have to tune in to find out. LET QUIZ COMMENCE! This week there's ALOT of news. But then again, DWM did keep it all till now to release so we dive right in and WOW! This year looks to be an AWESOME year to be Doctor Who Fan, especially us on the Podcast. Also, we start a look at Classic Doctor DVD Releases; and in First Month January Fashion we start with that little Gem of a story, The War Machines. A bit late, But Chaotic Scheduling will not keep George and I from reviewing this years Wonderfully spectacular christmas Special "The Snowmen". Aswell as that, There is some Pre- and Post-Christmas News aswell as a special announcement about a certain Quiz. Stay Tuned for more! In this first episode, Your hosts: James and George, discuss; 6th Doctor 'Colin Baker's escapades in the Jungle, The Christmas Special, 50th Anniversary special rumours and a quick quiz ends the show...... oh! and a few interesting "Kooky Theories" squeezed in for good measure. Enjoy!